Our series of tips to help you leverage the power of design and creativity to grow your business. This week: 05. Find the perfect match. Choosing the wrong creative can be costly and frustrating. So how do you make the choice right? Personal recommendations together with referrals from business support agencies or trade associations are THE best place to start. The internet works on peer to peer reviews and design services are no different. Don’t be shy to Google either. It’s a great way to find sites for designers with experience in your sector. If having lots of face to face meetings is going to be important to your project then a local area search is also a good idea. Hell, you can even find out who worked on that competitor brand you admire and request a meeting. 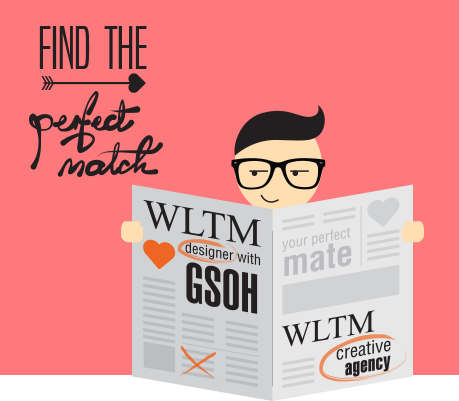 Once you have found 2 or 3 design agencies to choose from what next? Well believe it or not all you need to do is talk to them. Ask them how they would go about finding the answer to your problem – but not what the solution would look like. Ask them what they’ve done for clients in similar positions. And what value they feel they have added to their clients’ business. Delve into the thinking and methods behind their work. Ask to see evidence of a track record in problem solving and check out the things their clients have said about them. Chemistry is vital. Ask yourself if you could you work with them for the next 6 months or a year? You are about to entrust this person with the strategic direction of your business, so there has to be rapport and mutual respect. Next week: 06. Avoid brief grief!